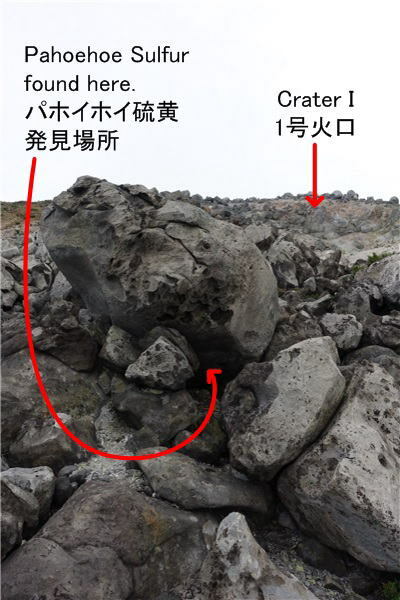 I was looking for sulfur sample which might show the eruption history of 1936 at 80 meters from Crater I. I looked into a large rock I was so surprised that there was a pahoehoe sulfur lava. Pahoehoe lavas are often seen in volcanoes like Kilauea which erupt low-viscosity lava. Bunch of ropes like pahoehoe pattern are often seen on the surface of the pahoehoe lava just like shown in the photograph above. 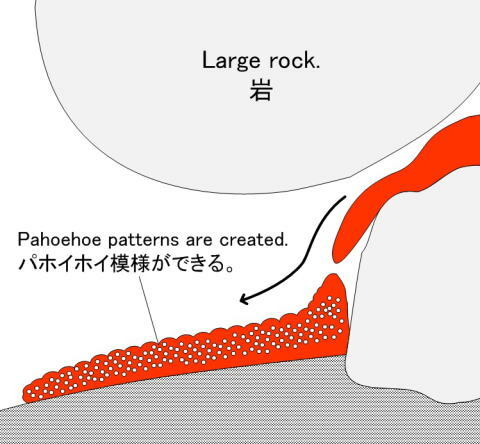 Most of pahoehoe lava is made of rocks. But this pahoehoe is made of sulfur. 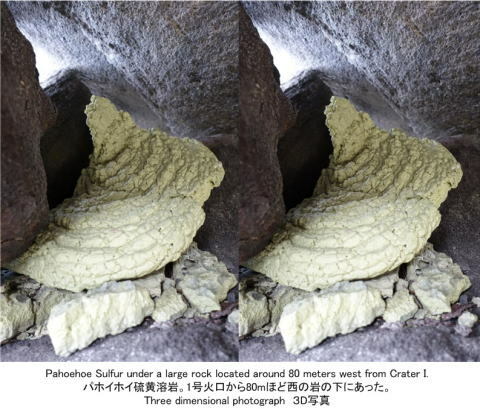 The pahoehoe sulfur was under this large rock located only 20 meters from the mountain trail. This pahoehoe sulfur lava seemed to have been created in 1936 and had been there more than 80 years. Because it was under the huge rock, it was protected from the rain and snow falls. 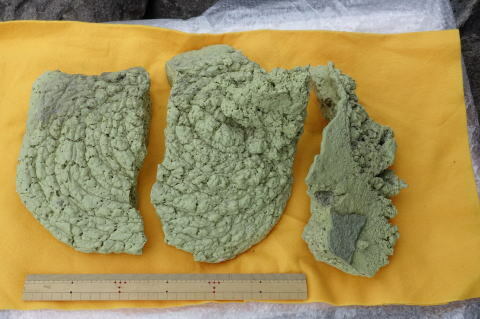 The Pahoehoe sulfur had been broken into two parts. The lump on the right is a part in the upstream. When the molten sulfur flowed into the space under this rock, iis color was brownish red. When it flowed on the ground it created pahoehoe pattern on the surface and cooled and hardened. When it cooled the color changed to yellow.